Carlos Delacruz is half dead and half alive. His intermediate status makes him the ideal detective—for the New York Council of the Dead, anyway, who employ him specifically to investigate those incidents where a tangible physical presence is needed to get the job done. It turns out that some phenomena are just too weird or too scary for your average actual ghost to get involved in. 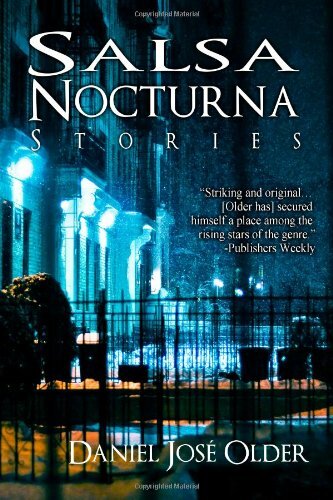 In Daniel José Older’s Salsa Nocturna , a series of linked stories described by the cover blurb as "ghost noir," we see Carlos deal variously with a rogue pachyderm (a gigantic ghost mammoth, in case you're wondering) who's wandered off course from its ancestral migration routes, a monstrous soul-stealing granny with a sinister penchant for doll collecting, a plague of murdered children, and a borough with a bad case of phantom overload. As well as Carlos, we meet Gordo, who's alive but able to communicate with the dead through the power of the music he makes, Jimmy, who retains intimations of mortality after almost having his soul snatched, paramedic Victor and healer Jenny, who provide Carlos with invaluable assistance in keeping him clear of the inappropriate ministrations of medicare, renegade soulcatcher Riley, and old soul Cane. These are the denizens of the world Older has created for us in his stories—a world of half-ghosts and phantoms, living and dead, the barely glimpsed populace of a New York that transcends New York, a city familiar and yet distorted, a realm that lies uncomfortably straddled between our own world and the world beyond it. The raucous, zany humor in Older's approach is highly enjoyable and the book as a whole has the feel of a robust and likeable caper movie. Older has an enviable gift for dialogue and vernacular language. These stories "sound" as well as they read—they ache to be read aloud. Salsa Nocturna is deftly worked within the context of its own parameters. Taken together, the stories form the kind of collection that in musical terms might be compared with the more imaginative kind of concept album— The Wall of the dead, if you will. The whole thing is skilfully entertaining. Whether this book ultimately succeeds on a higher level, though, is open to question—a question which has proved my biggest stumbling block in writing this review. There's been a trend in fantasy film and TV for some time now that I have a problem with—for want of anything better I call it the Happy Ghost Syndrome. By this I mean movies or series in which the central premise is that the afterlife is really not so very different from the life we’re living now. The dead—albeit unbeknownst to some of us—live alongside us and share our space. They experience family feuds, trouble with the council, difficulties with girls. The problems, rivalries, and prejudices they encountered in life continue beyond it and the dead are revealed not as wise elder spirits or ravening revenants but as guys like us. This approach was hilarious and original in Tim Burton's landmark movie Beetlejuice (1988), and in Anthony Minghella's Truly Madly Deeply (1990) the idea was given an attractive sepia-tinted Bach-infused poignancy. But twenty years on and it's everywhere. Was it the advent of Buffy that marked its slide into the mainstream? I'm not sure—all I know is that what was once original and fun has now been devalued to the level of cliché, and that this kind of "death with the Lyons" scenario has diluted whole areas of dark fantasy to the consistency of weak tea. A recent example of this tendency towards the anodyne can be found in what has to be the most tedious and derivative "horror" movie of 2012, James Watkins's The Woman in Black , in which the taut and sinister ending of Susan Hill's economical little novel has been replaced not so much with ghost noir as ghost-shlock, the happy little phantom family walking cozily off into the, er, mist. The problem with this down with the demons approach is that it declaws death. Someone once described ghost stories as "the literature of hope"—the argument being if ghosts are real then that means we go on, and going on, in whatever form, has to be better than irrevocable and total annihilation. I don't think there would be many dissenters from such a view—and yes, part of the glory of the greatest ghost stories and supernatural fiction is their suggestion that there are worlds beyond ours, more things in heaven and earth than can be imagined in our philosophies. No problem with that. The problem I have with this currency of the "same old same old" afterlife is its blatant escapism, its refusal to challenge, its failure to question our apprehensions and taboos around the subject of mortality. Stuff like this is not remotely frightening, or philosophical—it's a joke that's gone on for too long. There are moments of genuine unease in Older's stories—granny succubus's doll-crammed living room in "Skin Like Porcelain Death" is really quite nasty, most especially when combined with the idea that once your soul is trapped inside one of the dolls you're doomed to stay there forever. What I find less convincing—for precisely the reasons described above—is Older's concept of the afterlife as a paradigm of our own world, complete with a more or less identical set of injustices and social evils. So being dead is basically the same as being alive—only with superpowers? I enjoy this kind of thing on TV as much as anyone—indeed Salsa Nocturna would play brilliantly as a television franchise—but when I come upon it in the pages of novels or short stories it almost always feels derivative of the mass media from which it springs. It's all too convenient, too unsubtle, and runs the risk of robbing important themes of their full potency. In "Protected Entity," Riley and Carlos are called to investigate a worrying rise in the number of spectral black children in a particular neighborhood. The creature behind it all turns out to be the ghost of one Captain Jonathan Arthur Calhoun III, a shipping magnate and plantation owner who in life "kept New York harbor a central point in the transatlantic slave trade" (p. 47). Calhoun seems entirely unrepentant—certainly he's in no hurry to give up his depraved habits and perverted ideals in spite of the fact that he's been dead two hundred years. Carlos and Riley are preparing to dispatch this monster forever into nonexistence when they receive an urgent directive from the NYCOD—Calhoun is a "protected entity" and must on no account be "touched, harmed or insulted. . . . Failure to comply will result in banishment and termination" (p. 48). As a character, the stereotypical and cartoonishly evil Calhoun left me cold. His (still living) great-great-grandson John, with his misguided attempts to atone for his ancestor's crimes by obsessively cramming his apartment with valuable African artefacts, is actually a more insidious presence, a deluded, troubled character who I found far more disturbing through being less predictable. Reading Salsa Nocturna I couldn’t help but be reminded of Junot Díaz's The Brief Wondrous Life of Oscar Wao (2007), a similarly idiomatic book set in the Dominican Republic and in the Dominican community of New Jersey. Oscar Wao is stuffed with wonderful writing, together with the biting critical insight that you'd look to find in any work with aspirations towards political and social relevance. Díaz isn’t afraid to employ genre references either, but his version of reality is edgier and more driven by genuine crisis than Salsa Nocturna , the divisions between life and death—even without the ghosts—more immediately acute. Older is clearly a writer of much promise, but his stories, for the moment, are being weakened through the over-familiar nature of their raw materials. If he relied less on genre clichés and employed a more sophisticated approach to the fantastic his talent would be better served. Conventional media archetypes, through their very all-pervasiveness, are too often the enemy of serious purpose, and I can't help feeling that a more personally imagined response to the issues that are raised in his fiction would ultimately take his readers on a more rewarding journey. Nina Allan’s stories have appeared regularly in the magazines Black Static and Interzone , and have been featured in the anthologies Catastrophia , House of Fear , Best Horror of the Year #2 , and Year's Best SF #28 . A first collection of her short fiction, A Thread of Truth , was published by Eibonvale Press in 2007, followed by the story cycle The Silver Wind in 2011. Her stories have twice been shortlisted for the BFS and BSFA Award. Nina's next book, Stardust , will be available from PS Publishing in autumn 2012. Her website is at www.ninaallan.co.uk. She lives and works in Hastings, East Sussex.